The mountain road will be closed for events May 8-19 and Sept. 21-22, 2019 for special events. Go .2 miles east on Rt 131 to stop light, then turn left on Rt. 5 for 1.2 miles, then bear left on Rt. 44A for 1 mile. Camping: The park has 38 wooded tent/RV sites and 10 lean-to sites that are arranged within two camp loops. Hiking: There are five trails ranging in difficulty from moderate to difficult. The summit trail is 1.40 miles. Picnicking: There are picnic area throughout the park. There is also a picnic pavilion that is available to rent for group functions. Horseshoes: There is a horseshoe pit at the park. Flanking 3,144-foot high Mt. 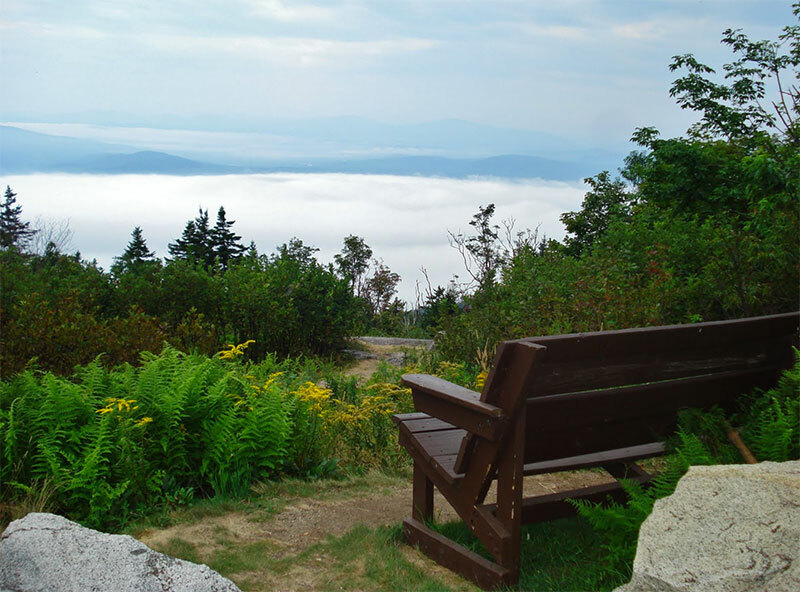 Ascutney to the north, south and east, the park is a favorite of many outdoor enthusiasts and sightseers. Mount Ascutney State Park was one of the first Vermont State Parks. It was built between 1935 and 1938 through the efforts of the Civilian Conservation Corps, a Depression-era program aimed at putting young men to work. The original park consisted of the summit road, the stone toilet buildings, campsites 1 - 18 and the ranger’s quarters. The original stonework is all of Ascutney granite. 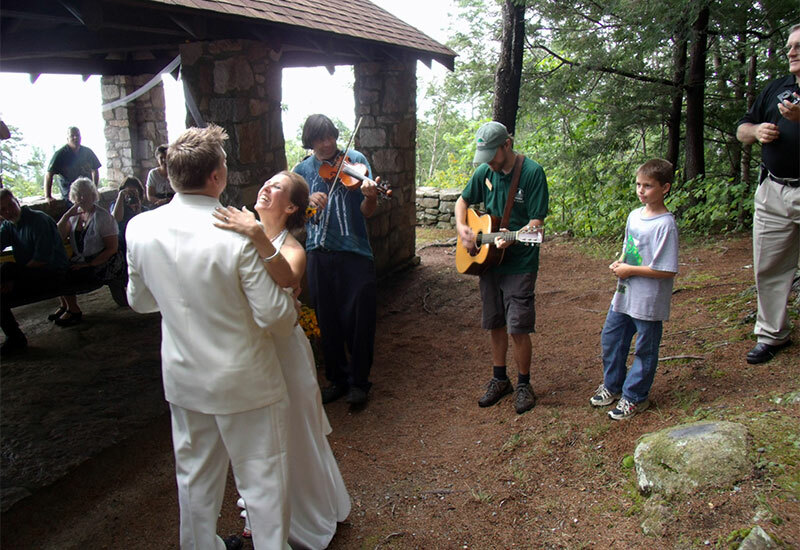 Mount Ascutney, which is named from the derivative of several Abenaki words meaning "mountain of the rocky summit," has long been a popular hiking destination. Vermont's, and possibly America's, first organized mountain-hiking trail was cut through its forests in 1825. Today, the park has four trailheads and more than 12 miles of hiking trails. The trails lead hikers to the sites of former quarries and homesteads, relics of past logging operations and other remains of a bygone era. Each trail boasts vistas with spectacular viewpoints of the Connecticut River Valley era en-route to the observation tower at the summit. Visitors seeking a less-strenuous trek may drive up the 3.7-mile Mount Ascutney Parkway to a parking lot at an elevation of 2,800 feet. A hike of nearly one-mile leads to the summit. In addition to hiking, the park is popular with visitors seeking a less-traditional visit. Each summer hundreds of participants from all over New England compete in automobile, bicycle and running races up the auto road. With its two launching sites, the park is also a favorite of hang gliders. The park has 38 wooded tent/RV sites and 10 lean-to sites that are arranged within two camp loops. Each loop has a restroom providing modern plumbing and coin-operated hot showers. There is a sanitary dump station for RV's, but there are no hookups. There is a small picnic area at the foot of the summit, and a picnic area part way up the summit road. The park also has a open, stone picnic pavilion that can be rented. It offers spectacular views and seats up to 30 people. There is no electricity or restrooms, but it has 2 charcoal grills and 4 picnic table and is near great hiking and camping. The cost is $100 to rent (Fri - Sun) and FREE Mon - Thu.